A new retail listing leak by GameStop Germany not only reveals Spyro Reignited Trilogy is coming to Nintendo Switch, but that it will arrive on August 16. As you may know, Spyro Reignited Trilogy has leaked for the Nintendo Switch in the past, on two different occasions in fact, but not since last July. And since the game shipped in November we haven't heard a single rumbling about a Nintendo Switch port. And so consequently, fans of the purple dragon began to wonder if the remake was ever going to come to the hybrid Nintendo console. Now, normally retail listing leaks should be taken with a big grain of salt. Mostly because they normally come from smaller foreign retailers, and in the past, have been all smoke and no fire. However, when it's a bigger retailer -- such as GameSpot -- it's normally pretty reliable. Further, the specific release date also adds another layer of credibility. It's true that retailers will sometimes go up with listings for games they think exist, and when they do so they either provide no release date or a generic placeholder date. But here, GameStop Germany gave a very specific August 16 release. And for those wondering, August 16, 2019 is a Friday, in other words the date checks out as plausible. That all said, you should still reserve a grain of salt and keep a hold of it until official confirmation comes way of Activision. As for the once leaked PC version of the game, well, there's been no word on this front. 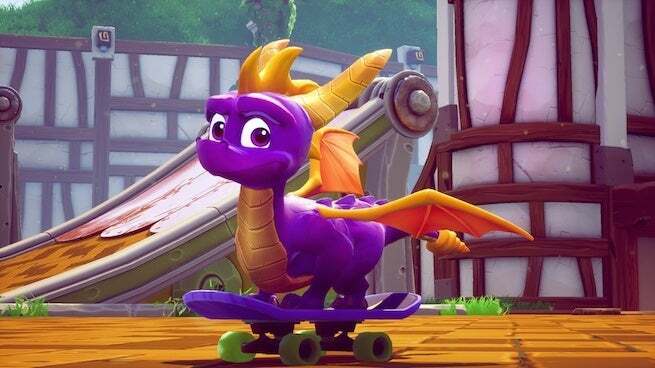 However, in addition to making its way to Nintendo Switch, Activision's Crash Bandicoot N. Sane Trilogy also eventually made its way to the PC, and so you would presume Spyro Reignited Trilogy would do the same. Spyro Reignited Trilogy is available for PS4 and Xbox One, at the price-point of $39.99 USD. For those that don't know: it's a remake of the first three Spyro games: Spyro the Dragon, Spyro 2: Ripto's Rage! and Spyro: Year of the Dragon. It's pretty neat, and breathes modern, new life into the classic PlayStation games many grew up playing. If you're a fan of the purple dragon and haven't checked it out already, you should.